Recently, I made a post about my gadgets here in Japan. This time I will show you my new gadget to watch TV on my EeePC netbook anywhere. My gadget is a 1seg TV tuner: IO-DATA GV-SC300. 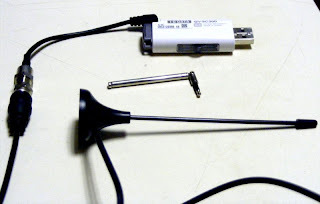 It is just a small USB stick with an antenna to tune the 1seg Japanese TV on the computer. 1seg is the name of a low quality digital TV broadcasting service that is mainly aimed at small handsets like mobile phones. The way it works reminded me of the SMS in the GSM mobile networks, in the sense that it makes use of some spare resource. In Japan, digital TV is broadcast using the ISDB-T standard, which divides the UHF spectrum 470MHz ~ 770MHz in 50 channels of 6MHz. This channels are then divided in 13 segments (in the time domain) and 1seg uses 1 of these 13 segments (that's why it is called 1seg). I can watch the TV everywhere I take my EeePC (for example, in a trip or to the park). A lot of programs also come with Japanese subtitles (transmitted with BML, a XML-based standard) so I can practice Japanese much better. It's cheaper than a normal TV (in Big Camera it cost me 6000 yen) . It doesn't occupy space like a normal TV, and I don't have to carry a TV when I change apartment. If you move fast it loses synchronism easily so you can't watch it in the car, bus or train.